Joe Berger is a fourth- generation New Yorker. He lives with his family in the city, and he’s been teaching guitar at the Riverdale Y for well over a decade. In 2009, along with his childhood friend and musician Teddy Wender, Joe founded the nonprofit organization MusiCan that puts music programs in public schools in the city’s most disadvantaged neighborhoods. Joe studied music composition at the California Institute of the Arts with famed musicians and composers Bill Douglas, Morton Subotnick, and Ravi Shankar. After college, Joe returned to New York City and performed with many music greats, including B.B, King, Al Jarreau, Bette Midler, Barry Manilow, John Abercrombie, Buddy Guy, Sean Lennon and Todd Rundgren, among numerous others. 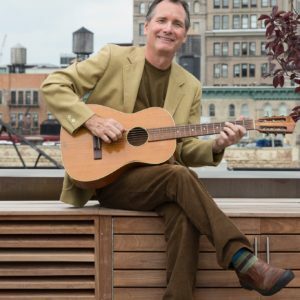 Joe is a fan of The Beatles and Miles Davis, and has also drawn inspiration from Long Island jazz guitarist and teacher (the late) Joe Monk, whose creative teaching methods and philosophy were legendary. He was also a member of, and toured extensively with, Stars on 45, the 1980s novelty band that started the medley crazy.